In the minds of liberals (by which I mean those trying to instigate a racial dispute, not all liberals), the facts of the case and Zimmerman’s legal defense are not those presented in court, but what was imagined well over a year ago. Trayvon Martin, an innocent unarmed honors student who happens to be black, makes a trip to the convenience store for a snack of tea and Skittles. An angry white man, who aspired to be a police officer, saw a hooded young black person and, for no reason apart from his own biases, assumed the individual was up to no good in this almost exclusively white neighborhood. This same angry white man had been arrested multiple times, having fought with his wife and even with police officers; however, his father was a judge, so he was able to make the charges disappear. The angry white man proceeded to follow the youth in his car, and, when Trayvon tried to get away, Zimmerman eventually got out of the car to confront Trayvon. A scuffle ensued, probably due to Zimmerman’s temper and bigotry. 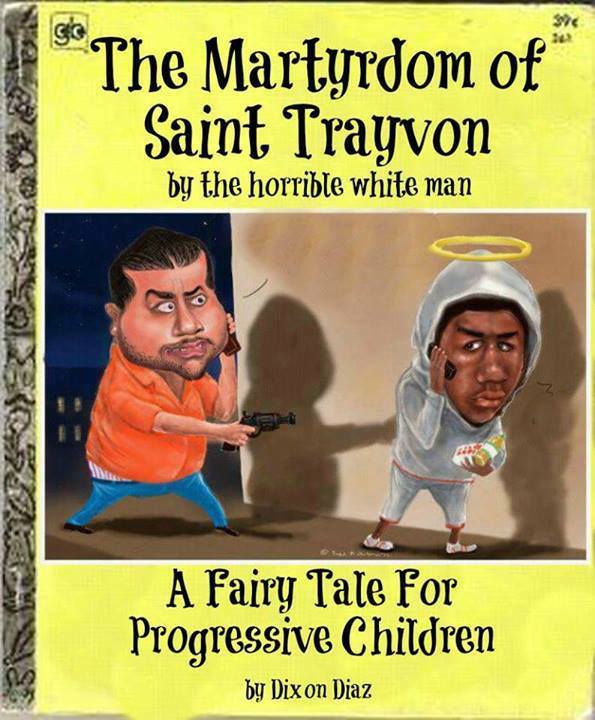 Trayvon begged for help, and Zimmerman shot him dead. It didn’t take long for people to realize he might be partly, or even mostly, Caucasian, but he’s not what most people would call white. Beginning to stop calling him white would have ruined the narrative before it even got off the ground, so it was decided to call him a white Hispanic. I’m not sure if this information came out previously, but this was the link I read when someone first mentioned Zimmerman’s past to me. It shows the mug shot photo that was frequently juxtaposed with a picture of Trayvon from his younger high-school years. No surprise there. I had never heard of rollingout.com before, but at least they corrected themselves and said it was one arrest. They also acknowledged that the case didn’t magically disappear; Zimmerman completed a diversion program that I imagine was arranged in open court and available to anyone, not just the family members of judges. Without any evidence, the site posited the question about Zimmerman’s father possible acting on his son’s behalf to get the charges dismissed. I think Stephen Colbert, who of course generally makes fun of conservatives in doing so, has demonstrated how silly the “I’m just asking questions” approach is. They’re deliberately designed to plant a thought. Why else is this significant? Well, I’ll tell you why: most underprivileged youths don’t have fathers for judges. Even though Zimmerman is Hispanic, as a “white Hispanic” with a father as a judge, he can’t possibly be in the underprivileged category. So that puts him in the privileged category with all the other whites. A liberal I know from a Facebook group actually stated that Zimmerman’s place in the societal power structure, combined with his actions against black people, made him white even if his background did not. Combatting blacks is a way to show the whites that you have joined them, apparently. To discuss what he actually is, Zimmerman’s father may be a white ethnic Jew, but the only people who seem to have a vested interest in this topic are Jews and anti-Semites. 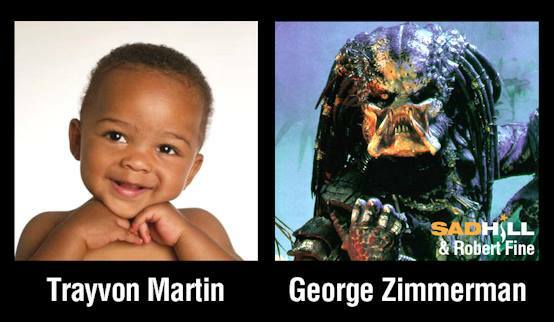 It’s safe to say that Zimmerman has substantial ancestry that does not originate from Europe. As one of the blogs I will link to mentioned, would this story have even made news if Zimmerman were named Jorge Mesa or something similar? Probably not even if his mother were a judge named Zimmerman. Obama stated if he had a son, the son would look like Trayvon, but whether that’s true or not, I wonder if his life might have had more in common with Zimmerman’s due to having a mother and father of clearly different ethnicities. There is extensive evidence that Zimmerman was not racist, including tutoring black kids and defending a black homeless man who was beaten by a police officer, but because he once complained (on Myspace) about Mexicans walking along the roadway, that confirms all the preconceived notions of racism. Of course, there is no reason to believe that he would not have commented on it in the same way that if the same activity was being carried out by half-Jew/half-Peruvians . Of course, he didn’t suggest any desire to commit any crimes, as Trayvon had done multiple times in social media (including mention of fights, seeking to procure a gun illegally, and mention of taking and seeking drugs, including “lean”, which can be made with sugary drinks and candy such as what he had purchased). Trayvon had also been suspended from school for having material with marijuana residue on it. This is why he was in Sanford rather than Miami. Had he lived in Sanford full-time or had his father been with the girlfriend (whose house Trayvon was going toward) for a long period of time, Trayvon and Zimmerman probably would have been acquainted, and there would not have been a confrontation. I don’t know what his grades were, but that’s hardly prototypical honors student behavior. The final element to debunk is “stand your ground”, which only modified the common law theory regarding retreat. It used to be that self-defense could only be invoked once the party asserting it had retreated until he could no longer retreat (“retreat to the wall” was the phrase I learned in law school). It isn’t some manufactured right to attack people arising because you think they look suspicious or have bad vibes. Also, it has shown to be a mechanism that actually often helps black people stay out of jail, which should be a good thing if you really care about black people suffering for simply being in the wrong place at the wrong time. Regardless, it was not relevant as they were both on the ground, and Trayvon apparently got a superior position where he was able to strike Zimmerman’s head on the concrete after breaking his nose. Trayvon had no apparent injuries, not even bruises, apart from the gunshot wound. Anyway, Zimmerman’s posture of lying on the ground is the relevant time period, because only then did he produce the pistol. Zimmerman says that Trayvon reached for it first after telling Zimmerman he was going to die, but, even if none of that was true, there was still no option to retreat. It’s far-fetched to believe that Zimmerman had a superior position at some point where he could have just ended it and withdrawn. Such a scenario would not only have to be believable, it would have to be established beyond a reasonable doubt in order to overcome the self-defense argument. Also, to be clear, “stand your ground” was not an issue in the trial. Some of those who admit “stand your ground” was irrelevant to the case are still claiming that it caused Zimmerman not to get arrested or prosecuted by local officials. Maybe in a retreat jurisdiction, he would have, but it’s also quite possible that the police and prosecutors would have thought self-defense without more evidence would have been too difficult a defense to overcome. I mention more evidence for a reason. As O’Mara pointed out to Al Sharpton, making an arrest starts the clock on bringing someone to trial. I believe he said it was six months–I suppose Zimmerman didn’t insist upon that time frame (he was booked on April 11, 2012). Regardless, you don’t want to start the clock unless you’re comfortable that the evidence is there. A lot of what media and politically motivated commentators thought would be there in terms of evidence didn’t materialize. Also, there could have been great evidence out there that just didn’t come out yet. If Zimmerman had been arrested that night, and there were no time waivers, and he went to trial in August of last year, any information found out after that point would have been useless. He would have already been tried. I don’t know if this is serious or not, but it demonstrates how easily this could have gone in the other direction. What if Trayvon’s remarks to Rachel Jeantel about Zimmerman were construed as anti-gay bias? Couldn’t special interests and the left-leaning media have woven a narrative around that? If they hadn’t chosen one already, that is. Speaking of sticking with a narrative, one of the most revealing conversations I’ve seen about this matter was between Piers Morgan and Larry Elder. This isn’t surprising coming from him, but Morgan did admit that he thinks Zimmerman should be punished because he killed a person with a gun, no matter the reasons or circumstances. Then he pretended to care about how many blacks die in Chicago. I wonder how many of their names Piers knew or how many interview guests he’s had on who happened to be the last person to speak to any of them on a phone. 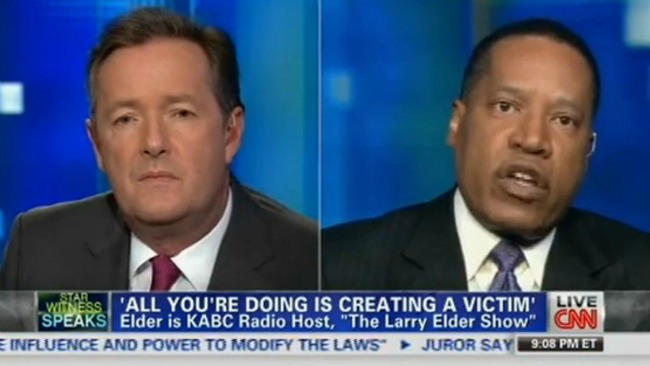 Larry Elder wasn’t a very cooperative guest, but that’s the only way to counter how Morgan runs his show. He wanted to dwell on Jeantel’s intelligence (or lack thereof), when what does that have to do with the problems of black kids dying, if that really is what Morgan cares about? What does that even have to do with disarming Americans, which seems to be Morgan’s primary cause in life? But more important than that, whether we’re talking about Morgan or Sharpton or even Obama, it’s just about keeping the sideshow going and treating adults (especially black ones) like children. “I think the jury made the right decision based on the evidence presented because the prosecution inadvertently set the standard so high that the jury had to be convinced that it was a deliberate act by Zimmerman and that he was not at all defending himself,” Carter said.